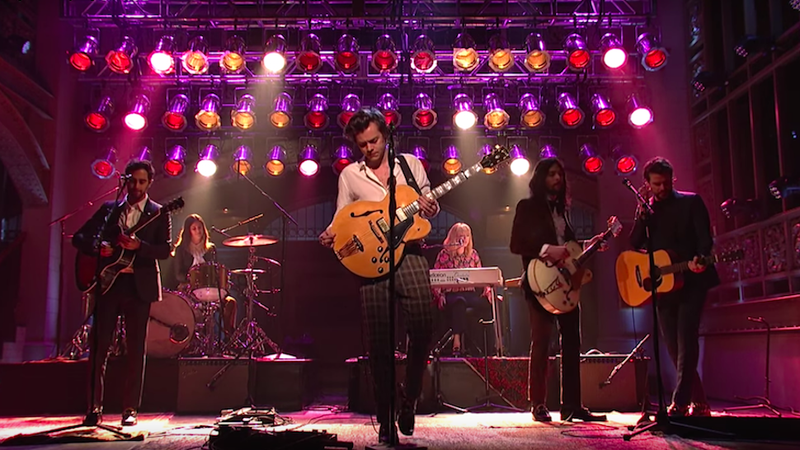 Harry Styles was the musical guest on Saturday Night Live this weekend and, in debuting his new solo material, excelled on the notoriously difficult (both acoustically and logistically) SNL stage. He also looked very hot while doing it—which may have been a surprise to my coworkers, but could NEVER be a surprise to me. Oh, Harry. My sweet elven prince. Many doubted that your solo material would be good, but I didn’t because I love and support you, as I always have, as if you were my own step son or, better yet, pool boy. You won my affection when work forced me to sit through two showings of Morgan Spurlock’s One Direction documentary This Is Us and my heart has not doubted that investment, never once. “Ever Since New York,” one of the songs you performed, shocked those who do not know you like I do. It was a little Ryan Adams, a little ‘70s roots rock at the chorus, and 100 percent HOTTIE WITH A BODY (he’s 23, it’s fine! ), even with your wonky singing faces and the guitar it looks like you’re barely playing. Point being, I will buy/illegally download this album and very much enjoy it. In return, all I ask is that you take me out to dinner and kiss me on the mouth. You also appeared looking very handsome in a patterned suit (“you should get a patterned suit,” I texted my partner while watching you perform) to sing “Sign of the Times,” another song I enjoyed very much. It felt a lot like an Aerosmith ballad, which might sound like an insult, but I promise you that I mean it as a compliment. Point is you can really sing and wear a suit, two special skills that most people don’t have. Babe, I think you did a great job across the board and now, finally, everyone else agrees.